Today is the 3rd Sunday of Advent. Traditionally this Sunday is known as Gaudete Sunday, which is Latin for rejoice. We rejoice that soon and very soon, we are going to the King, Jesus Christ our Lord. The two visible signs of Gaudete Sunday is the rose colored candle on the Advent wreath, along with the rose colored vestments that the priest and deacon wears for this weekend’s masses. The Advent purple blended with Christmas white produces a rose color, which symbolizes that we are almost at the celebration of Christmas. This year, as the calendar dates fall, next Sunday is December 24, which is Christmas Eve. It is also the 4th Sunday of Advent. It is important to know that all of the morning Masses for December 24 will be for the 4th Sunday of Advent. The Christmas Masses will begin with the 5:00 Vigil Mass for Christmas, which will be our Family Mass. This year’s Vigil Mass will be held at Holy Rosary Church. As Catholics, we must fulfill our Sunday Mass obligation and the obligation to attend Mass on Christmas. Therefore, to fulfill the Sunday Mass obligation, one must attend the Saturday evening Mass at St. Peter Claver on December 23 or any of the normal scheduled Sunday morning Masses between the three churches. To fulfill the Christmas Mass obligation, one must attend either the Vigil Mass for Christmas at 5:00PM on December 24, the Midnight mass at 12:00AM Midnight which will be held at Our Lady of Victory, or any of the masses on Christmas day. As we prepare our hearts to welcome the Lord this Christmas, let us continue to pray for unity and peace throughout our nation and within our families. We are in dire need of God’s peace and love now more than ever. Christ comes to us as the light of the world that is in immense darkness. May the light of the Christ child continue to illumine our society in all that we say and do. During the season of Advent, we will pray solemn vespers, (evening prayer) on Wednesday evenings. The theme this year is “Go to Joseph”, spiritually preparing ourselves for the birth of Christ, through the intercession of St. Joseph. This Wednesday, December 20, our Advent vespers will conclude at St. Peter Claver Church beginning at 7:00PM. In addition to Vespers we will have the ancient prayer of Lessons and Carols. It is a beautiful spiritual preparation for Christmas. We will welcome Father Mark Bristol, a priest of the Diocese of Brooklyn who currently serves as Associate pastor of St. Anastasia Parish in Douglaston, New York as the homilist. Please be sure to join us. This year we are inviting children of all ages to participate in our Christmas pageant, which will take place on Christmas Eve at the 5:00PM Mass at Holy Rosary Church. Rehearsals will begin soon! You may contact Michelle Joseph our Director of Faith Formation or Tamika Daniel our parish Youth Minister for more information about this year’s Christmas pageant. The season of Advent comes to its midpoint today. Over these last few days of Advent, we have been hearing from the Prophet Isaiah, as he foretells the coming of the Lord. As we get closer to the Feast of the Nativity, we see the image of Jesus Christ as a light that dispels the darkness of this world. During this season of Advent, it has been my prayer and reflection, that the light of Jesus will continue to illumine this world, but most especially our parish community, as we strive to be faithful and holy witnesses of him. Over the last few days, I myself have been reflecting on the joys of my priesthood. This June I will celebrate 8 years of priesthood, which have been filled with great joy and happiness. As many of you have come to know, I like to write my thoughts on paper as you have seen in the parish bulletin and the Diocesan newspaper, The Tablet. I have been jotting thoughts on paper since my ordination almost 8 years ago. Just the other day, I looked up some of the thoughts and reflections that I had written during my very first Advent as a priest. They are actually the reflections of Pope Emeritus Benedict XVI. It was his homily at Vespers for the First Sunday of Advent. He spoke of us instruments of God in this world. He said, “We are therefore spirit, soul and body. We are part of this world, tied to the possibilities and limitations of our material condition, while at the same time we are open to an infinite horizon, able to converse with God and to welcome him within us. We are active in earthly realities and through them we are able to perceive God’s presence and to reach out to him, Truth, Goodness and absolute Beauty. We savor fragments of life and happiness and yearn for complete fulfilment. God loves us deeply, totally and without making distinctions. He calls us to friendship with him, he makes us part of a reality beyond every imagination and every thought and word: his divine life itself”. Let us continue to be instruments of God’s love and mercy in this world, until Jesus his Son comes to bring us to heaven. During the season of Advent, we will pray solemn vespers, (evening prayer) on Wednesday evenings. The theme this year is “Go to Joseph”, spiritually preparing ourselves for the birth of Christ, through the intercession of St. Joseph. This Wednesday, December 13, our Advent vespers will be held at Our Lady of Victory Church beginning at 7:00PM. 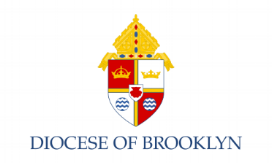 We will welcome Father Mark Bristol, a priest of the Diocese of Brooklyn who currently serves as Associate pastor of St. Anastasia Parish in Douglaston, New York. Please be sure to join us. Today we celebrate the 1st Sunday of Advent. The season of Advent marks the beginning of a new liturgical year. Advent is one of the most beautiful and fruitful liturgical seasons within the Catholic Church, although it is brief, only 4 weeks. I invite all of us to use these next four weeks of Advent to spiritually prepare our minds, hearts and souls for the birth of our Savior, Jesus Christ. I challenge us, myself included, not to fall into the trap of the commercialization of Christmas. We need this time to prepare our hearts for the birth of Christ, who comes to us as a child. During this beautiful season, our scripture passage focuses on the prophet Isaiah. The prophet proclaims “prepare the way of the Lord, make straight a highway for our God.” May this season bring us the joy of welcoming Christ into the homes of our hearts. This Friday, December 8, the Church celebrates the solemnity of the Immaculate Conception of the Blessed Virgin Mary. It is a Holy Day of Obligation. Masses will be celebrated at each of the three churches, 8:00AM at Our Lady of Victory, 12:00PM at St. Peter Claver and 7:30PM at Holy Rosary. Through the powerful intercession of our Blessed Mother, may we continue to grow closer to the heart of her son, Jesus Christ. During the season of Advent, we will pray solemn vespers, (evening prayer) on Wednesday evenings. The theme this year is “Go to Joseph”, spiritually preparing ourselves for the birth of Christ, through the intercession of St. Joseph. This Wednesday, December 6, our Advent vespers will be held at Holy Rosary Church beginning at 7:00PM. We will welcome Father Josephjude Gannon, a priest of the Diocese of Brooklyn who currently serves as Pastor of the parish of St. Gerard Majella in Hollis, New York. Please be sure to join us. And bid us hail the dawn of grace. O Come Divine Messiah, the World in silence waits the day when hope shall sing is triumph and sadness flee away.